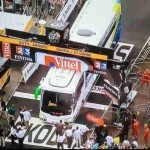 Home » Sports Talk » Bus Crashes Finish Line at Tour de France?….Maybe I Should Watch This! 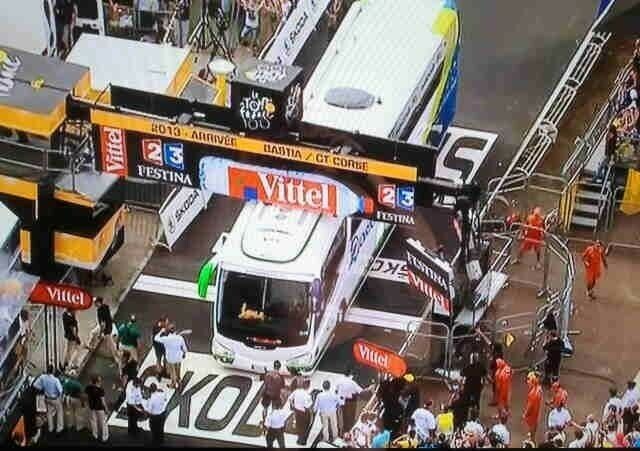 Bus Crashes Finish Line at Tour de France?….Maybe I Should Watch This! 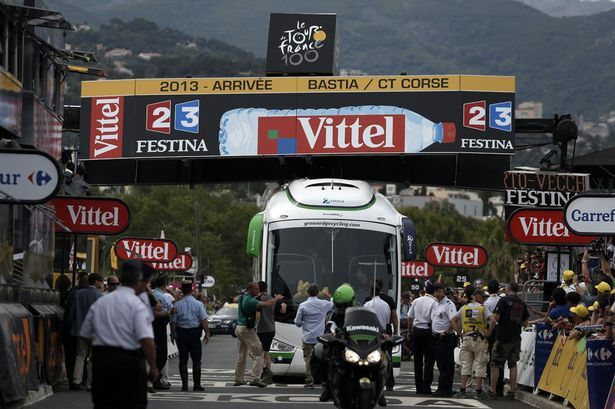 Corsica–With stage 1 almost complete in the fabled Tour de France, the team bus for Orica-GreenEDGE did not quite make the squeeze under the finish line banner going across the road. As steam and coolant leaked from the roof where AC units were punctured by the overhead structure, the riders were mere minutes away as race officials tried desperately to come up with an alternative finish scenario. Cameras were able to catch an obviously distraught bus driver sweating it out and I think sobbing as Corsicans and French came together in international problem solving cooperation and managed to finally move the bus off of the finish as riders literally came into view. That was actually a let down. For someone who cares nothing and knows even less about cycling, this was a most entertaining afternoon. As I waited for the Red Sox game to start and catching some Wimbledon match ups, I happened across The Tour de France and caught about 4 fantastic crashes and then this random bus accident threatening the whole of Stage 1 finish times. Okay Tour de France, you have my attention. Keep up the carnage and destruction and I’ll let all the doping scandals and lack of people named Lance go by the wayside. Are spectators still allowed to throw tacks and nails on the road? Is fighting ever involved between racers or even teams? I have to pay closer attention here! Stage 2 is on right now. Breathtaking helicopter shots and peaceful island views are thus far ruling the day. Everyone is after some guy in a yellow jersey. Let’s get something going people! Throw a bike pump in the spokes of the guy next to you or something. It’s Sunday, and this ugly American needs some action! Enjoyed the article. Short, sweet and informative. I hope we see more of your work here. What I like most is the the compelling name of the event. Tour de France. For the non-francophiles amongst us, “de” is a French word meaning, “of a spectacularly monotonous biking event through the Yeti infested mountains of” France. Super cool. My mistake. Apparently the French word “de” actually means “of”. This will lead any person searching “Tour of France” on Google to actually finding relevant information on this bicycle race on page 782 of said search.